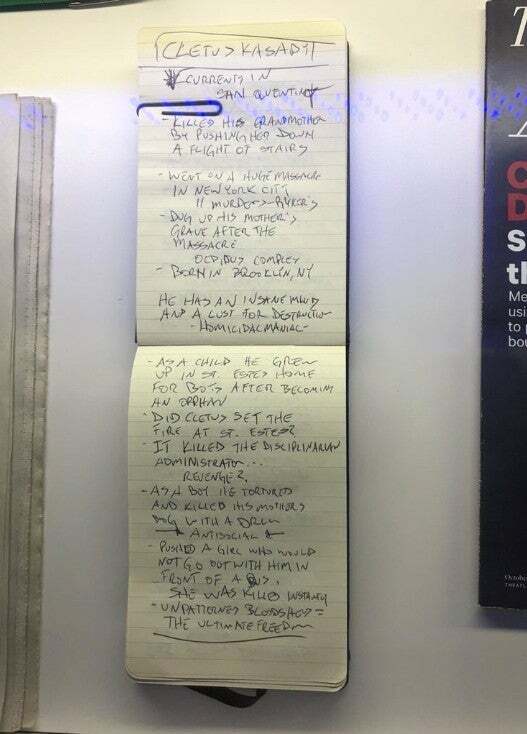 A notebook belonging to investigative journalist Eddie Brock (Tom Hardy) on display at New York Comic Con revealed juicy details about Venom’s sequel villain: currently incarcerated serial killer Cletus Kasady (Woody Harrelson). According to Eddie’s scribblings, Kasady racked up a high bodycount over the course of his life before being jailed in San Francisco’s San Quentin prison. Kasady pushed his grandmother down a flight of stairs, killing her, later going on a “huge” massacre in New York City before slaughtering 11 people in Ryker’s maximum security penitentiary. As a child, an orphaned Kasady grew up in St. Estes Home for Boys, which was later set aflame — by Kasady, Brock suspects — killing the Disciplinarian Administrator. Brock’s notes also reveal Kasady tortured and killed his mother’s dog with a drill and once pushed a girl in front of a bus, instantly killing her, when she rejected his advances. The details match Kasady’s comic book history, where he was an unrepentant, psychopathic serial killer with a vicious bloodlust long before he ever bonded with the red alien symbiote and became the dangerous supervillain known as Carnage. In the Marvel comics, Kasady was once the cellmate of a jailed Eddie Brock, who had been defeated by Spider-Man. When a pregnant Venom symbiote freed Eddie from prison, its spawn latched onto and bonded with Kasady, who emerged as Venom’s most-hated archfoe. The powers of the Carnage symbiote made the villain so powerful it forced Spider-Man to team with the Fantastic Four and uneasy ally Venom to defeat Kasady, ultimately sending him back to prison following a citywide killing spree. Harrelson will feature in a bigger role in a Venom sequel. Sony is expected to move forward with future franchise entries after Venom pulled in a record-setting $80 million in its opening weekend, giving it the biggest-ever October opening.